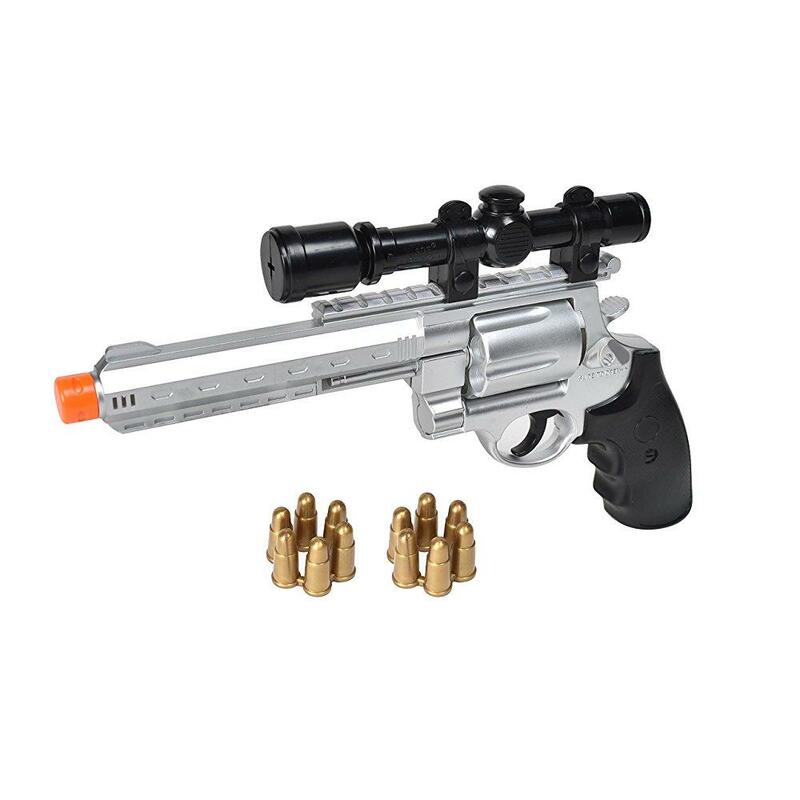 We have a huge selection of Toy Guns with realistic detailing, lights and sounds at great low prices! For ages, girls had dolls and boy had guns. The situation isn’t all that black and white today, but that only means that girls can play with guns as well and you shouldn’t be surprised if your daughter asks for a toy shotgun for her birthday. Back in a day, we didn’t have much choice when it came to toy guns. Mostly there were cowboy guns and anything else was very rare. Then Star Wars and other science fiction came and everything changed. Now you can find almost any imaginable (and few unimaginable) toy guns out there. Here is our pick of the best toy guns in each category. 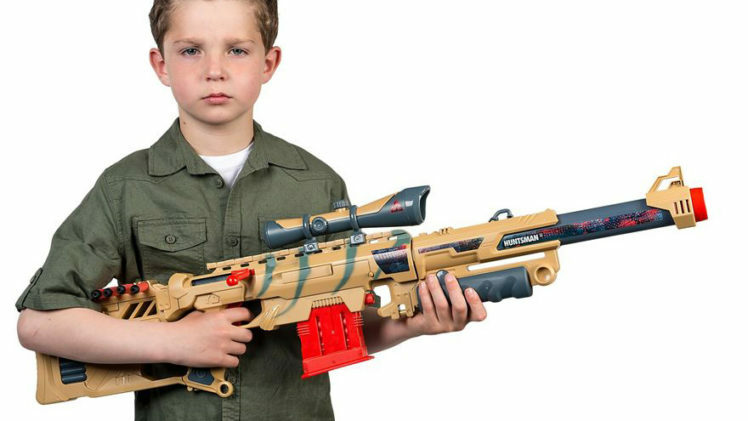 Designed for ages five and up, this gun looks and feels like a real thing. For added effect, it comes with lights, which means it will need batteries. The scope can be removed and the cylinder rotates with every trigger press. Made of plastic, but with wood grain effect on parts that would be made of wood on the real gun, this shotgun looks the part. It comes with four shells that can be loaded and fired from it. It needs batteries for the sound effects that add to the realism. This double-barreled monster can fire a dual stream of water up to 60 feet, hence the name bazooka. Pool parties will never be the same once you buy these for your kids. Soon, you will need one for yourself for defense, if nothing else. This one isn’t for children. Airsoft guns can be very dangerous, and, depending on your stet, you’ll need to be 16 or 18 in order to use them. Even through clothes, an airsoft ball will leave a painful mark and protection is mandatory when playing with them, especially googles or preferably a full-face mask. The.45 is a great entry weapon if you plan to take on airsoft. With a ball velocity of 300 FPS, it offers a nice performance without breaking the bank. It is compact and easy to use. Designed for kids eight and up, this Nerf blaster holds 25 darts and has a rate of fire of three darts per second. It comes with a tripod mount, making it an excellent defensive weapon. Your kid will have a substantial advantage over their opponents with its superior precision and fully automatic fire.